Chattanooga is known as the Scenic City, and most residents can quickly rattle off the top spots to take advantage of rewarding views. From Lookout Mountain to the Riverwalk and Sunset Rock, you’ll find plenty of postcard-worthy winners. But your feet will remain planted firmly on the ground. For a unique view of Chattanooga, take to the sky for some truly inspiring vistas. A trip above the Tennessee River Valley can be a relaxing experience, like a ride on a hang glider, or a more thrilling adventure like skydiving. Either way, you’ll get some views to truly remember. 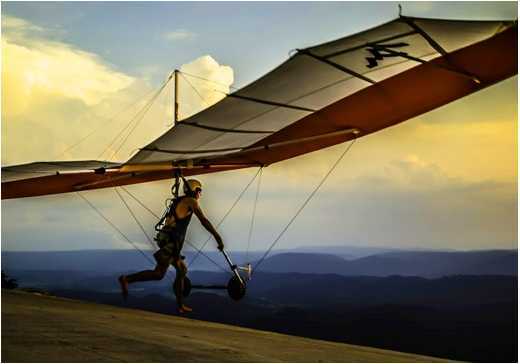 Started in 1978, the Lookout Mountain Hang Gliding Flight Park has been attracting people to the sport and providing incredible rides from the heights above Chattanooga. It’s one of the oldest established hang gliding flight schools in the country, with more solo pilots trained here than anywhere else in the world. Instructors will help you go from beginner to pilot as you work your way up gradually from the bunny hill to the top of the mountain. Newcomers to the sport can opt for a tandem flight, in which an experienced pilot will take you on a ride. The one-day experience starts with controlled flights on small hills, taking you five to 10 feet off the ground. After the morning instructional session, you’ll be ready to take off with the pilot on a flight either 1,500 or 3,000 feet above Lookout Valley. No experience is necessary for a tandem ride, and it’s an amazing adrenaline rush to check off your bucket list. Are you ready to jump out of a perfectly good airplane? 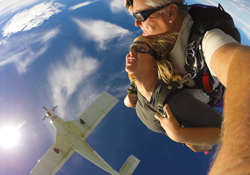 You can experience the thrill of a freefall through the Chattanooga Skydiving Company, located just west of the city in Jasper, Tenn. For first-timers, a tandem skydive is the safest and easiest way to access the sport. No experience is necessary, as beginners will work with experienced instructors in a short training session on the ground to learn the basics of the jump, and then you’ll take to the sky for a scenic flight with your instructor to reach altitude. You’ll make the jump while securely attached to your instructor. After a freefall of either 60 seconds or 120 seconds, you’ll pull the ripcord and enjoy the quiet ride down to the ground, seeing the Tennessee River Valley like never before. You can even get a video of the entire adventure. Love the experience? The Chattanooga Skydive Company offers skydive programs that can take you from tandems to solo jumps on your own. Maybe flying through the sky isn’t exactly your thing? The High Point ZIP Adventure at Ruby Falls​ still gets above the ground—but up among the trees rather than over them. The courses consist of suspended obstacles that include ladders, nets, tunnels, bridges and, of course zip lines, which will thrill adventure seekers with this unique tour up above Ruby Falls. The three courses target children (age 6-10), youth (age 11 and over), and adults, each with age-appropriate challenges. 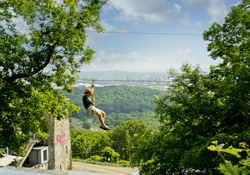 The adult Blue Diamond course features a zip line ride with excellent views of Chattanooga. There’s also a 40-foot climbing tower, and the Tower Zip Ride, which features a view of the Ruby Falls Tower.